Roast marshmallows outside and make s'mores. Go to the Drive-In movie. Road trip to a Texas Rangers game. Learn to drive (that is specifically for Ben). Head to the lake and water ski. Go on a family vacation. Quit drinking soft drinks & instead drink water. Take more photos - with my big camera. Sleep outside in a tent. We have just under a month before school starts back. Not much time to accomplish the rest of our list (but we are gonna try!) Atleast 4 of the items left are going to be attacked over the next two weeks. How about you? 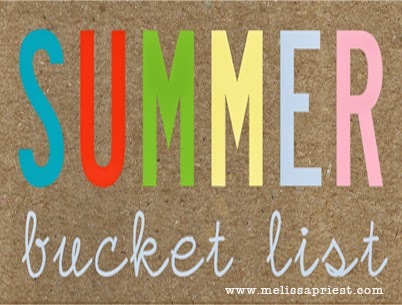 How are you doing on your Summer Bucket List?